Judy Carne was a renowned English actress of 1960s who was most notable for her great comic timing. She painted a pretty picture of a vibrant auburn-haired damsel who preferred to live life the way she wanted to with a bright smile on her lips. 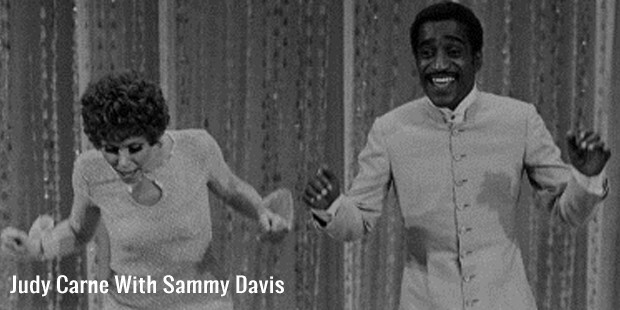 She is especially remembered for her “Stock it to me!” character in the popular TV series “Rowan & Martin’s Laugh-In”. Joyce Audrey Botterill was born on April 27, 1939 in Northampton England to a greengrocer couple. Since her childhood, she has always been interested in music & dance and even took active lessons at Bush Davies Theatrical School For Girls & Pitt-Draffen Academy of Dance. An ardent performer at local concerts with continuous encouragement from her parents, Joyce changed her name to Judy while she was 16. Though she debuted in television with The First Day of Spring in 1956- yet Judy had her first ever serious tryst with the television world at the age of 22 for Danger Man & The Rag Trade in 1961 for British television. In 1962, she bagged a role in a comedy film “A Pair of Briefs” which proved to be really successful for her. She soon shifted to America. After she shifted to Hollywood, Judy grabbed the role of an English teen Heather Finch who moves to the States to stay with an US family in Fair Exchange in 1963. It was followed by further opportunities in The Baileys of balboa in 1964 & Love on a Rooftop with Pete Duel in 1966. Over the years, Judy had made numerous appearances in a string of TV shows like The Man from U.N.C.L.E, Gidget, 12 O’Clock High, I Dream of Jeannie, Bonanza, The Big Valley as well as QB VII TV adaptation in 1974. 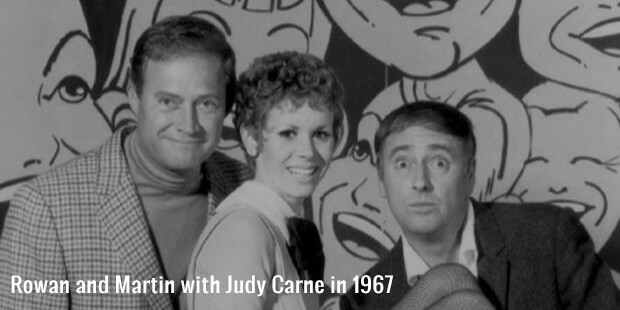 In I Dream of Jeannie, Judy appeared twice, once as the Jeannie & later as herself. In 1968, she bagged the famous role of “Stock-It girl” in the super successful “Rowan & Martin’s Laugh-In”. Her filmography includes two films The Americanization of Emily in 1964 & All the Right Noises in 1971- added to A Pair of Briefs. The most important highlight of Carne’s career is her “Stock it to me!” role in “Rowan & Martin’s Laugh-In” that brought overnight fame to her- and earned her immense applause for her wonderful comic timing. 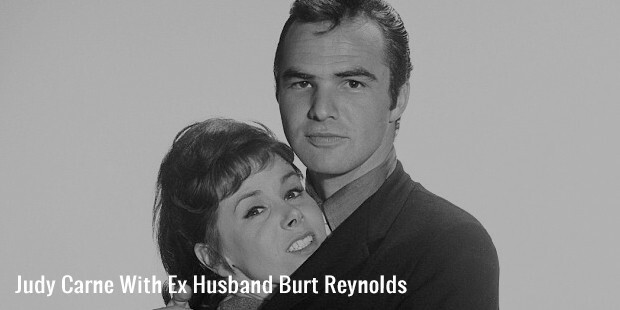 Carne was married twice- once to Burt Reynolds & for the second time to Robert Bergmann. Both the marriages unfortunately ended in divorce & were childless. Judy was a bisexual and had long-standing affairs with women as well. She published her autobiography, titled, “Laughing on the Outside, Crying on the Inside: The Bittersweet Saga of the Sock-It-To-Me Girl “in the year 1985- that chronicled her issues with failed relationships and addiction to drugs. In her last days, she shifted to Pitsford village in Northamptonshire to live a quiet & peaceful life. 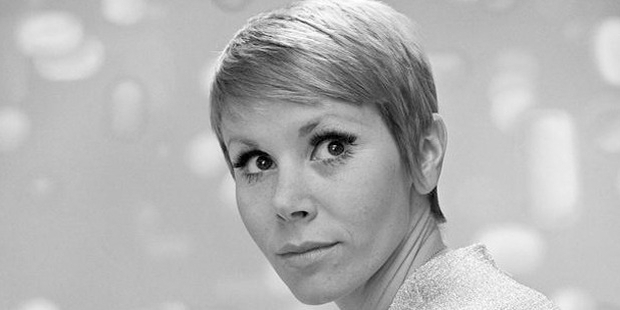 Judy Carne died of pneumonia on September 3rd, 2015 in Northampton. Carne has always been admired for excellent comic timing and she could have easily stayed at her peak for a much longer time had she not been such a damaged soul.